When I was dealing with a pretty severe back injury in 2015, I was trying to find all kinds of different positions to get comfortable. This post is a guide to the best pillow for back pain, based on my personal experience. I tried different solutions and had different results. I was searching for a way to get comfortable in my bed so I could get a good night of sleep. This post talks about the importance of a good night of sleep for recovery. I also needed something just for laying on the floor, or the couch, really anywhere I was laying down, I was trying to get comfortable. Now hang with me here, this may get a little long-winded, but it’s going somewhere, I swear. Like I said, I was in pretty bad shape. My wife had to help me get dressed (so, because of her help, I actually looked decent for work) and I couldn’t stand up straight. What a great combination! Oh, I was a sight let me tell you. My co-workers and neighbors didn’t know what to think of me. Everybody kept telling me I needed surgery (been there, done that). I had faith in my chiropractor, but that is another story. My story is interesting, I have a long history of back problems. Most recently, I suffered a sprained pelvis and had spinal stenosis at the same time. Talk about being messed up. I was doing stupid things at the gym, that really served no purpose, other than boosting my ego. Why would I ever need to move a bus anyway? I ended up hunched over about 30 degrees at the waist. Spinal stenosis is typically a narrowing of the spinal canal, but can also just be pressure on the spinal cord. That is what I was dealing with. I blew a disc and it was pushing up against my spinal cord. So, I was hunched over, I couldn’t stand up straight. I couldn’t sleep laying down flat on my back, I was propped up on the couch so I could basically remain in the seated position while sleeping. 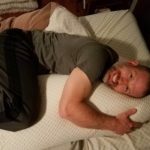 I struggled to find the best pillow for back pain so I decided to write a post about this subject. I had to ice my lower back/pelvis area for about 6-8 weeks to help reduce the swelling. I did this anywhere from 5-8 times per day. Wake up early and ice, go to work, try to find a place I could apply ice to my lower back. Come home from work and ice again. I was frozen all the time! I did a lot of laying on the floor with my legs propped up. My chiropractor recommended I try some different options as far as pillows for back pain go, in order to prop my back up or my legs up, or whatever I needed to get comfortable so I could get some rest and recover. So, I tell you all of that because I want you to know that I have pretty extensive experience with back pain. What I am trying to say is that given my experience, I can provide some insight into products that may help you with back pain. I will do my best to provide a quality review and give you options that will potentially help. That was my motivation behind writing about the best pillow for back pain, so I can hopefully help someone out there who is dealing with back problems. So, with that, let’s get right into things here. First things first…where have you been all my life? I have to say, this pillow system offers you a ton of versatility. You will love the ability to customize this to get maximum support, where you need it most. This is not a “one-size-fits-all” kind of system. Sleeping with a wedge pillow back pain can be put to rest! These four separate pieces allow you the flexibility to move and adjust them specifically for your needs. The Back Scoop offers lumbar support. You can slide the scoop up and down, wherever you need it most. The headrest is moveable or removable if you need. The Knee Rest can be placed wherever you need it, no matter your height. The Avana Kind Bed system is made of a microfiber material that is very soft and comfortable. All of the pieces are made of medium density urethane foam with a one-inch layer of memory foam. Super comfy! Looking back, this would have been a perfect solution for me. I needed to sleep in an upright seated position with my legs bent or elevated. I really wish I had been able to find this when I was going through all of my back issues. This would have been a home run for me. One thing I find really great about this pillow system is that it’s 100% machine washable. This unit can be used as a stand-alone unit or is best suited against a wall, or headboard. Plus it is available in a wide variety of colors. You have some many options available with this system, it’s not necessarily just for a back injury, or back pain. It can be used to sit up in bed while you watch TV, you can work on your laptop or tablet, even eat breakfast in bed! I just really think this support pillow has so many advantages, making this a great pillow for back pain. Well, here is another fantastic option if you are looking for a pillow for back pain. The Comfort Dreams Zero Gravity Adjustable 3-Piece Wedge System is a three-piece system designed for maximum comfort. Again, not a one-size-fits-all solution, you have options here. The wedge base forms a 90-degree angle and is concave on one side to fit seamlessly with the back support piece. The back support is flat on one side, the side you lean against, and is convex, to conform nicely to the base. This concave and convex design allows you to maneuver the angle of the pillow system just exactly how you want it as it is infinitely adjustable. The leg support is free to be moved wherever you need it. You can use this system up against a headboard, or stand alone. The core is high-density foam with a one-inch layer of memory foam on each piece. Again, I think this is a fantastic option for people suffering from back pain. When I was working through my back issues in 2015-2016, I had to sleep in an upright position, almost like I was sitting in a chair. I tried the couch, sleeping up against the arm and backrest, I tried a pile of pillows behind my back in bed. This would have been a great solution for me. Even if you are not recovering from an injury, this is a great addition if you watch TV in bed, work on your tablet or laptop. Just about anything where you need to be laying down, but upright, this system is great. I love the fact that the covers are machine washable, that way when you spill buttery popcorn and a drink, you have nothing to worry about. 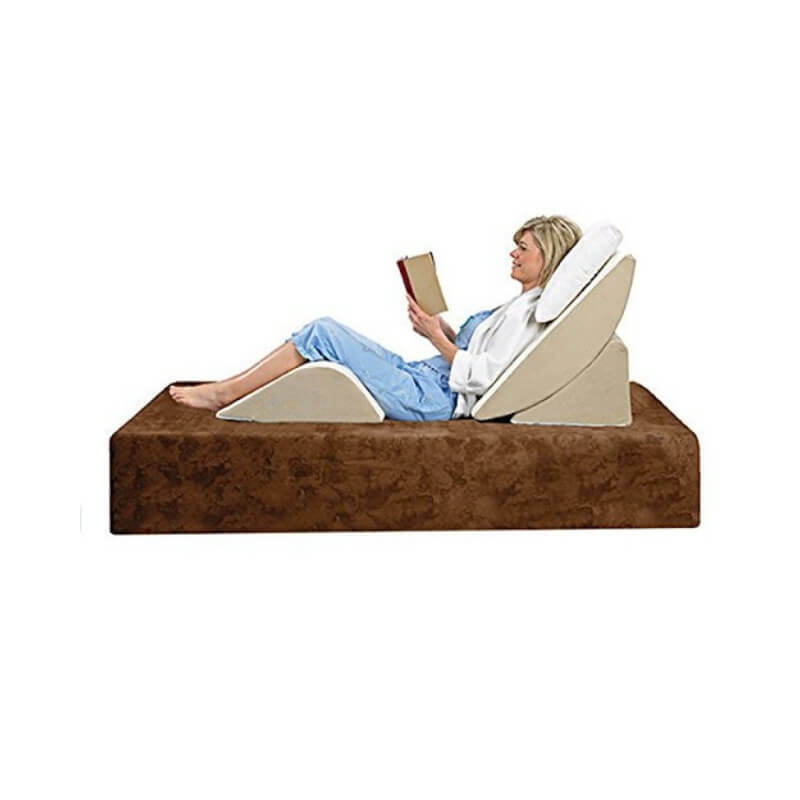 Comfort Dreams Zero Gravity Adjustable 3-Piece Wedge System, Head and Foot support with this Wedge Pillow. Sleep well with the comfort of Memory Foam.Great for an Acid Reflux pillow, comfort when kids are playing Playstation 3. This little guy may not look like much, but it is super functional. I don’t know if you normally sleep with a pillow between your legs, but it’s awesome (even from a man’s perspective). As someone who has dealt with a lot of back pain over the years, this has been a lifesaver at times for me. Now, this pillow is not just for back pain relief, but can also be used for pregnancy and hip or joint pain, to name a few other ailments. The idea is to keep the spine aligned and this can help to relieve pain. This pillow is designed with two concave sides on it, so you can place it between your thighs, knees, calves, wherever you need it. It is made with high-density memory foam, so you won’t have to worry about it losing its firmness. You will really enjoy the soft, breathable cover, which won’t make you hot. The cover is also machine washable and has a zipper so you can take the cover off with ease. This is one of the best knee pillows for back pain you can find. Customers are very happy and have shown this with a lot of positive reviews. You can use this pillow in a variety of positions. Use it between your legs, or underneath one leg for an elevated option. If you have one problem side (mine is my right side) you can roll over and put just one leg on the pillow. It is really, really versatile, and that is what makes this one of the best pillows for back pain. This pillow is not just for back pain, my wife loves to sleep with one just because she likes how comfortable it is. Don’t let the name fool you! You don’t have to be post surgical to enjoy the benefits of this awesome leg pillow. I used one of these extensively when I was recovering from my back injury. Kick back, put your legs up and get ready for some comfort. By using leg pillows back pain may subside and you can concentrate on getting a good night of sleep. The 8-inch height was perfect for me during my recovery in 2016. I had stenosis, so I was hunched over at the waist. This pillow allowed me to mimic the bent at the waist position. I used this for a long time until I go to the point I could sleep on my back again. The leg elevating pillow can be used not only for an achy back, or recovery from surgery but is also good for people who want to put their feet up at night and give them a break. This pillow is really soft and comfortable and I have first-hand experience with that. You will love the look and feel of the breathable cover and memory foam pillow. I did struggle a bit at the beginning with this pillow, as I am kind of a wild sleeper. Once I got used to it though it was a huge help to me. I really liked the fact that I could hang my heels over the end, as I often sleep that way as it is. You can put the pillow anywhere you want it, as far as where you need it to be for your comfort level. I also used this on the floor in my living room as I was icing my back. I had an icepack under my lower back and my legs elevated. This is an excellent pillow for back pain. Again, the cover is removable and completely washable. Don’t be shocked when you order this and it is shrink wrapped, it will expand when you open it. ACHING FEET? RELIEVE YOUR PAIN AT ONCE! 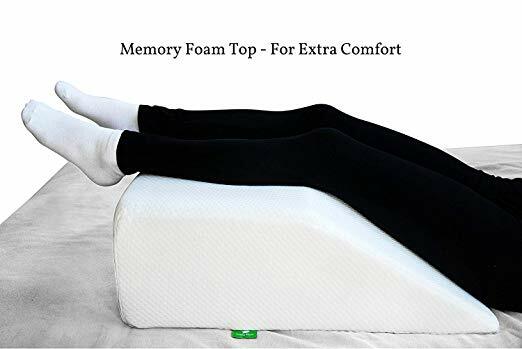 : By keeping both legs elevated, this great memory foam layer support pillow can improve circulation, relieve back, hip, and knee pain, and help reduce the discomfort of swollen feet. It's a great way to improve your sleep quality at night, or have short, comfortable breaks from your routine and get some relief throughout the day! 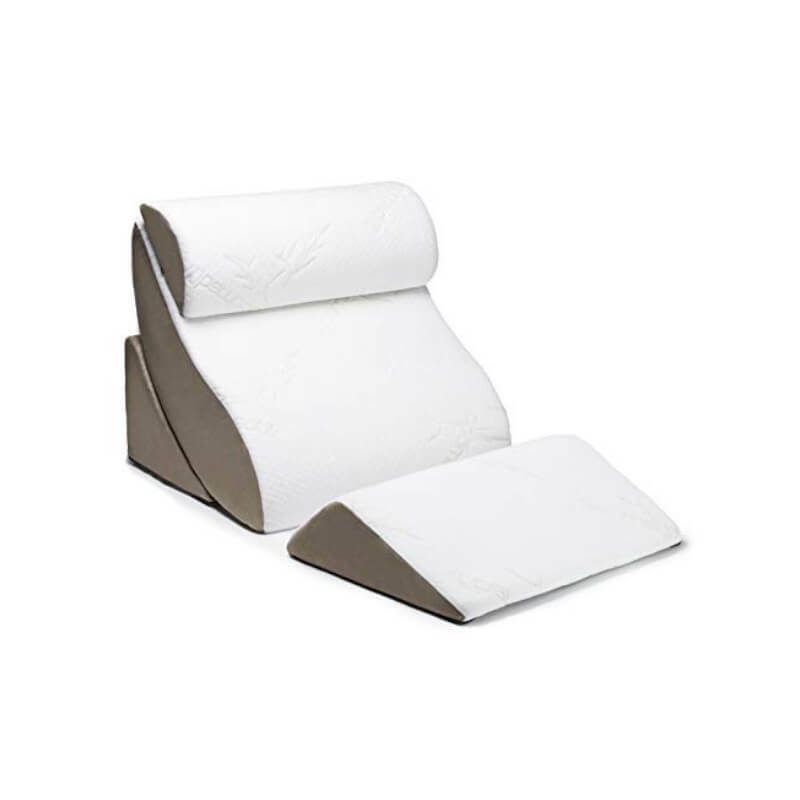 IMPROVE YOUR BLOOD CIRCULATION: The leg rest wedge pillow is a great way to help your feet remain healthy and prevent blood stagnation and varicose veins. What's more, in case you're on the mend from a foot or ankle injury, or post surgery a leg elevation pillow like this practically mandatory. Not only will it reduce the pain, it will also keep your body in the optimal position for a quick recovery! 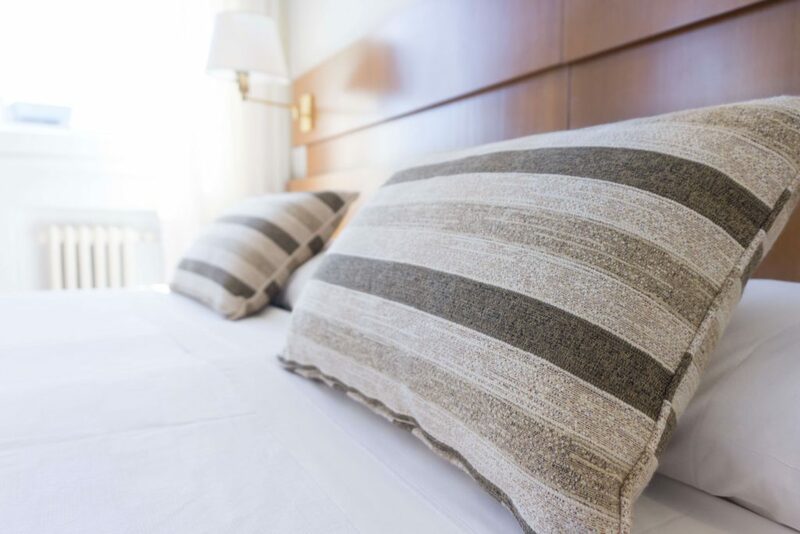 HIGH DENSITY MEMORY FOAM: When it comes to our leg rest pillows, we make a point of using nothing but the best polyurethane and memory foam available, as well as state-of-the-art production processes and strict quality control. That way, we can be sure they meet the high expectations of our customers - you! BREATHABLE & WASHABLE COVER: In addition to its comfortable memory foam top layer and PU foam composition, the bed leg support pillow has a soft and breathable cover. Not only does it help it maintain a comfortable temperature, it's also easily removable and machine washable! Okay, don’t judge me! Yes, I am a man and yes I sleep with a body pillow. Given my history with back problems, I am so over it! When I was early on in my recovery, my chiropractor said the first goal was to get me to sleep in the fetal position in my own bed, so I wasn’t upright on the couch. A body pillow was my best friend :). Anyway, moving on. I mentioned earlier that some people may require a bigger pillow to support the thighs, knees, and ankles. Well, this baby will do all of that for you. 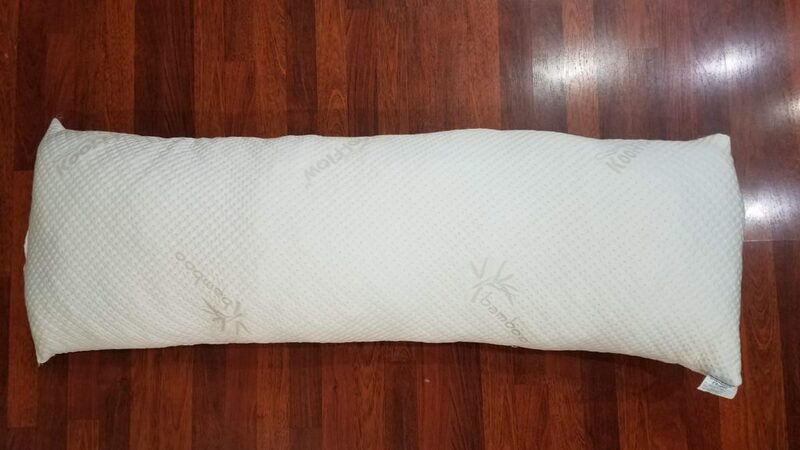 If you have problems with hips, shoulders, back or your neck this body pillow literally has you covered. If you don’t currently sleep with a body pillow, you are in for a real treat. You will be able to shape the pillow to your exact needs. 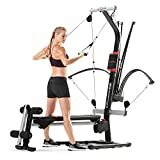 It is lightweight and you can easily move it around at night. The great thing is that your full body will be properly supported when you are sleeping on your side. Your spine will (should be) in proper alignment. By using a body pillow back pain may improve when you are trying to get a good night of sleep. The innards of this body pillow are made from organic latex and are spiral in shape. This gives the pillow a really light and airy feel with the support of memory foam. Kind of the best of both worlds. The soft and super comfy bamboo cover is absolutely wonderful to snuggle up to. Plus the cover is antimicrobial/antibacterial so it will stay clean and free of those pesky germs. If you are looking for a fantastic, pillow for your whole body to enjoy, this has to be atop your list. ORGANIC SPIRAL LATEX INTERIOR FOR SOFT AND COMFORTING SUPPORT |The inner material consists of soft and supportive organic latex. The latex is specifically engineered into spiral shapes that provide soft melt-into-your bed comfort yet full and abundant support. The organic spiral latex gives you the light-weight comforting feel of feathers yet the fullness and responsiveness of memory foam. PLUSH AND SOFT ANTIMCROBIAL + HYPOALLERGENIC BAMBOO COVER |The super soft and plush bamboo cover offers a deeply inviting level of comfort that you simply won't be able let go of. Bamboo also offers naturally occurring antimicrobial and hypoallergenic properties that keep your pillow clean and germ free. FULL BODY ORTHOPEDIC RELIEF - SHAPEABLE TO YOUR NEEDS | The pillow is easily shapeable to your orthopedic needs and your sleep preferences. It can easily be moved around at night with its light-weight organic latex material yet will provide full-body orthopedic support that relieves pain across the back, neck, hips, shoulders and legs. The orthopedically engineered latex spirals ensure the pillow won't go flat and will provide snuggly comfort throughout the night. A PERFECT NIGHT OF SLEEP FOR EXPECTING MOTHERS | Body pillows are perfect pregnancy pillows for expecting mothers due to the position and support they provide to the fetus, back, neck, shoulder and legs during sleep. The pillow holds mothers in a comfortable half-fetal position, which relieves pain and prevents mothers from sleep positions that place to much pressure on the fetus during sleep. As I mentioned previously, when I was dealing with spinal stenosis a few years ago, I needed to sleep all propped up. I tried jamming a bunch of pillows behind my back, up against the headboard, but that didn’t really work so well. 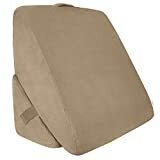 My chiropractor recommended a wedge pillow and it was one of the best things for me at the time, in my recovery. It’s not just for back pain, as I know some people like to have a bed wedge for watching TV, reading, or they have other minor medical issues (breathing, snoring) they may use it for. But this served me extremely well when I was recovering from my back injury. This pillow helped to simulate the hunched forward posture I had at the time and just plain worked well. Depending on your back problem, this can be a great pillow for back pain. You will love the recliner like feel that this pillow provides cushy memory foam comfort, with a breathable, washable cover. The slope and height of the pillow allow users to find just the right spot to sleep, where you need the support most. By sleeping with a wedge pillow back pain may improve, allowing you get the good night of sleep you so badly deserve. This is something that did take me a little bit of time to get used to. I kept rolling over and had to get used to realigning myself. That is more of a “ME” problem as I tend to roam a lot when I sleep. But after a bit, I got really used to sleeping on it. Come to think of it, I need to break this pillow out again and give it to my wife (she is a snorer)! This arrives in a small box and will expand when you open it. Don’t be alarmed. TURN YOUR BED INTO A COMFORTABLE RECLINER - By improving your body posture and supporting your upper back and shoulders, this bed wedge cushion can relieve you of back and neck pain, as well as aid you with breathing, snoring, GERD and acid reflux issues. 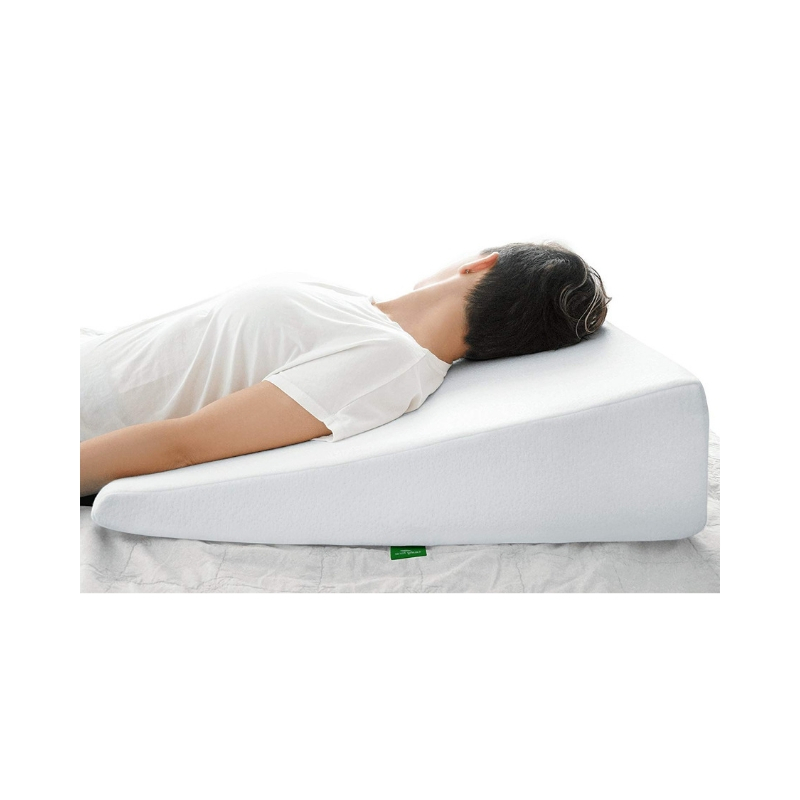 IMPROVE YOUR OVERALL HEALTH - This bed wedge riser promotes a better sleep position and prevent orthopedic health issues with your spine, neck and shoulders. 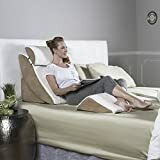 Multipurpose and adjustable - enjoy the perfect angle degree as an anti snore pillow, positioning the wedge upright while watching TV or reading - or you can even use it for leg elevation! HIGH DENSITY MEMORY FOAM TOP - To maximize comfort and fit your body's shape as best as possible, the bed wedge pillow features a layer of high density memory foam. The foam contours to your shoulders, neck and head, offering you a uniquely comfortable slope for a restful experience. Wedge measurements are 25 x 24 x 10 inches. The Cushy Form Wedge is firm and will not collapse under your body. We recommend using an extra pillow on top for neck and head support. BREATHABLE & WASHABLE COVER - In addition to its comfortable memory foam layer, the bed wedge pillow has a soft and breathable cover. Not only does it help it maintain a comfortable temperature, it's also easily removable and machine washable! Well, here we go again with another body pillow. But this isn’t just any ordinary body pillow, have you seen this thing? It looks more like a body pretzel! 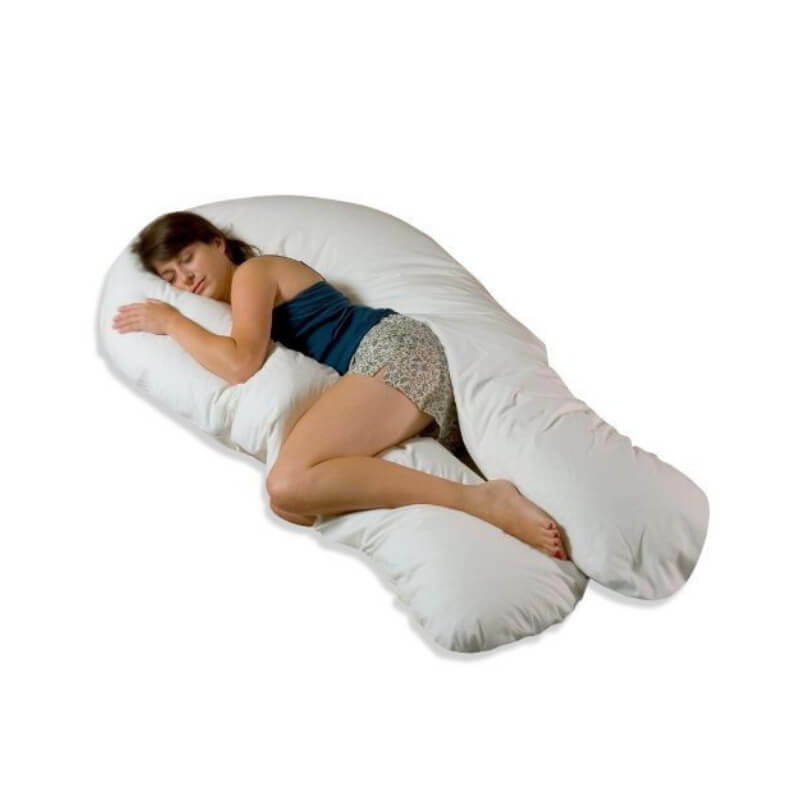 I know it’s giant, but this pillow can benefit you in so many ways. Whether you are a back sleeper, side sleeper, tummy sleeper, this pillow has got you covered. It is very versatile to say the least. The pillow is “U” shaped and it is one solid pillow, not multiple pillows jammed together. The pillow molds itself to you and is filled with Fusion Fiber keeping it soft and fluffy. The filling really helps to keep you cool at night as well. You can twist, contort or do whatever you do when you sleep and get maximum comfort from this pillow. I know a lot of people try to sleep with a lot of extra pillows in bed, just so they can grab whichever one is closest when they are asleep. Problem solved! You can sleep with this between your legs, giving your spine the support it needs. You can curl this pillow up behind your neck, and still have your knees elevated. It’s great for sleeping, watching TV, or reading in bed. The pillow comes with a zippered pillowcase that can be washed. The entire “U” shaped pillow can be washed in a washing machine and dried in a dryer. Per Moonlight Slumber, the pillow will not bunch, clump or flatten. Overall, this is a great pillow and many people have written very positive reviews about the comfort they have experienced from back pain. As someone who dealt with spinal stenosis for many months, I was looking for a solution to prop myself up in bed so I could sleep. I had to maintain a bend at the waist since I was not able to be fully upright. The Xtra-Comfort Bed Wedge Pillow would definitely fit the bill for someone in my situation. By sleeping with wedge pillow back, pain can be an afterthought and let you get the zzz’s you need. Okay, so you don’t have to have back pain to use a wedge pillow, of course, this is great for reading in bed, or watching a movie as well. This pillow system can be used by different folks for different reasons. The versatile 3 in 1 design can be used under your legs, behind your back, and of course under your head. The pillow measures 22 inches wide and 12 inches deep. You will love the high-density memory foam, making the wedge soft and supportive. This wedge will also fit a variety of body types and sizes. The zippered cover is removable and machine washable so you can rest assured that it’s easy to maintain. The ultra soft cover is made of a breathable polyester in a natural beige color. A carrying handle makes it easy to carry this wedge pillow from room to room or take it with you when you are on the go. Okay, who knows where you will take it, but it’s nice to have the option should you choose to. This setup is great for propping yourself up without the hassle of piling multiple pillows behind you and trying to keep them in one place. This wedge will maintain its shape and provide you with excellent support. If you are looking for a great wedge, pillow back pain or not, you should definitely give this one a try. VERSATILE 3 IN 1 DESIGN: The foldable bed wedge can be used under the head, the back or the legs. Measuring 22" wide and 12" deep, the wedge easily fits on any bed, providing additional comfort and support while sitting or sleeping. A convenient carry handle makes traveling with the compact, folding bed wedge easy. SUPPORTIVE BREATHABLE MEMORY FOAM: Constructed with a high-density memory foam, the bed wedge is soft, yet supportive, contouring to the body to provide optimal support. The comfortable foam retains its original shape for extensive usability. The bed wedge can also be used with your regular pillows. REMOVABLE, WASHABLE COVER: Easily removable, the zippered cover is made with a soft, breathable polyester material. Machine washable, the cover is a neutral beige. GREAT FOR SLEEPING: Everyone has different neck or back positions that they prefer when falling asleep. 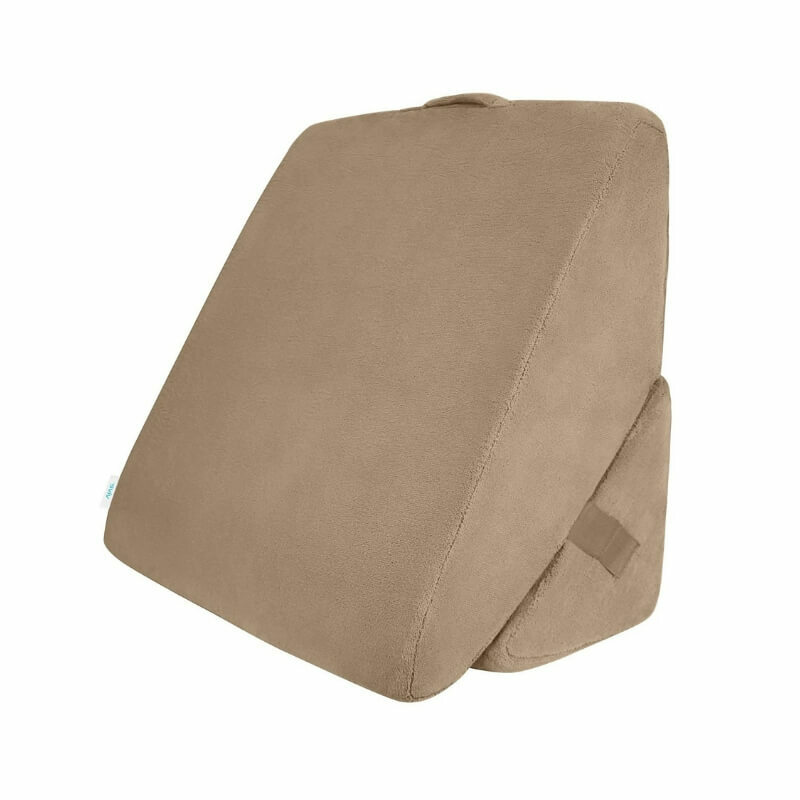 Our versatile bed wedge pillow can provide a gradual or steep slope that allows your head to elevate to get just the right amount of pressure. VIVE GUARANTEE: We stand by our products with USA based customer service and a guarantee!. I love this pillow, I sleep with it every night! I am a little over 6 feet tall and this pillow fits me really well, not to short. I am a side sleeper and after I recovered from my back injury in 2015, I needed a good body pillow to help keep me properly aligned. In short, I use this body pillow for back pain, so I can sleep comfortably at night. The Snuggle-Pedic pillow can be used for others as well, pregnant sleepers, stomach sleeper and side sleepers to name a few. 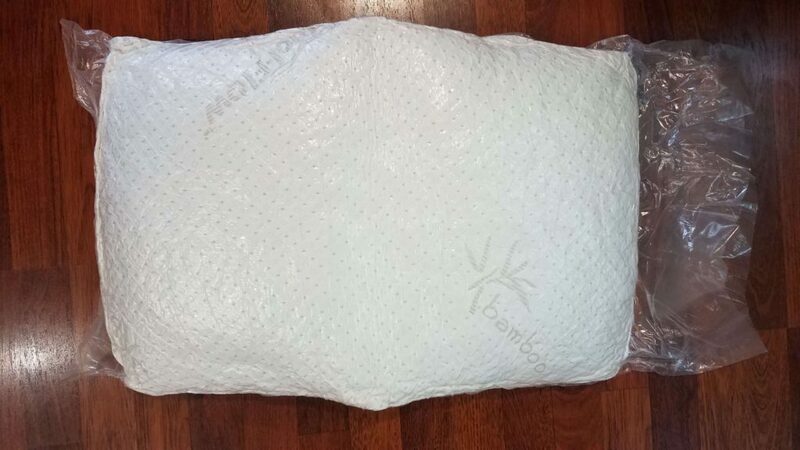 The pillow comes in a shrink wrap package and I was pretty shocked when it arrived. This pillow is great, it never goes flat and you can throw it in the dryer if you need a little extra fluff. The pillow is approximately 20 inches wide by 54 inches long. After unwrapping the pillow and putting it in the dryer, per the instructions, it was ready to use. With an industry leading warranty, you are sure to have this pillow for many years to come. I think this is a great pillow, not only if you suffer from back pain, but for the other reasons mentioned as well. You can also place this under your knees if you need to elevate your legs. Well, that was a lot of ground to cover. Depending on your specific needs, it will be tough for me to tell you exactly which pillow is right for you. I have provided a number of options and hope that, is helpful. These options will depend on if you are recovering from an injury if you are a side sleeper, tummy sleeper, back sleeper, or what have you. I had specific needs when I was recovering from my back injury, so I used a couple of these different options. Now I use the Snuggle-Pedic body pillow every night. My wife is super jealous! Please let me know if you have any questions or comments and I will do my best to get back to you as soon as I can. All of these look really comfortable. I’ve had back pain pretty much my whole life due to slight scoliosis. Is there a pillow or something you can recommend? I need something for sitting at a computer all day. Thanks for another great article. Hi, thank you for your comment. I would definitely speak to your doctor about the proper way to support your back with scoliosis, but I can recommend a very good lumbar support. Depending on how bad your condition is, you may also benefit from a back brace. Thank you very much for stopping by. Hello Steve, great review!!! My mother has to deal with back pain from time to time, and one of these pillow would be perfect for her. I might consider purchasing the moonlight slumber, she would love it. Thanks again, and continue to do what you do!!! Thank you Ahmad. It’s amazing how much difference a pillow can make, especially with back pain. Sometimes it’s hard to find just the right position, or to get your body set just right. Pillows can really help out. Let me know if you have any questions, or need any advice, I am here to help. Back pain is the worst thing to have. I can’t imagine the pain that you are into, just by reading this article. I can relate because I have back pain too but not as severe as yours though. I do have a body pillow, and I love it, it really helps me to sleep. I also like the idea of the wedge pillow, this seems like a solid option, depending on your pain. Anyway it’s a great review. Thanks for sharing. Thank you for stopping by Mina, I appreciate your comment. I am glad you are having success with the body pillow. Let me know if you have any questions, I am happy to help. Wow, you have an amazing selection of useful products here! I have had numerous back, knee, hip etc problems and I know all about icing all the time! I sleep with ice packs on my hips and knees and lately even my ankles sometimes. The post surgery Elevating Leg Rest Pillow looks like it might work well for me. The picture makes it look larger than your description. Are you saying the total height is only 8 inches? I have long legs so if I picture myself laying like that it would be like a foot tall! I think the body pillows or the knee pillow would be useful for my husband. He is a side sleeper and I introduced him to a pillow between his knees which really helps. I imagine the knee pillow would be an improvement if he could get used to it and the body pillows would give more support to his entire body. Hi Jessica, thanks for your comment. Yes, the elevated pillow is 8 inches tall, I agree the picture makes it look taller than that. This is the type of pillow I used when I was dealing with stenosis, as I had to mimic being bent over as I was laying in bed. Now I use a giant body pillow and I love it and highly recommend it! Hi Babs, thanks for stopping by. I know, we sit so much these days, and back pain is pretty prominent. I think the Avana Kind is a great option as it is so versatile. Let me know if you have any questions, I am happy to help. Back pain is a worst thing to have. I can’t imagine the pain you’re going through. I can relate because I do have a back pain as well but not as severe as yours. I am using the Body Pillow, and it helps to sleep. It makes my position comfortable since I tend to sleep on the side more. Anyway, great review and thanks for sharing. Hi Mina, thanks for stopping by. I love my body pillow, it really helps to keep properly aligned when I sleep on my side. Let me know if you have any questions, I am happy to help. Your Review is awesome. I suffer from spondylitis, shoulder pain and hip pain. So far I have never tried using any of the product mentioned by you. I lose my sleep in mid night due aggravation of pain. As per my doctors advice I use wooden chair, sleep in the floor and do mild exercises. I prefer using any of the suitable product mentioned by you. This was caused due to excess riding motorcycle in rough Indian roads. I will be happy if you can suggest a suitable product which is globally available. I am sorry to hear about your spondylitis condition and I hope you are able to get some treatment. I understand how rough roads over a long time can be rough on your back. You are best to speak with a doctor and see what they might recommend. I know the Avana Kind pillow system is very versatile. Also, I have been in a situation where a stiff wooden chair was the only way to get comfortable and I too have slept on the floor, so I can understand what you are dealing with. I wish you the best and appreciate your comment. All of these look really comfortable. I struggle to know where and what to buy for comfortable sleeping and back rest. What do you recommend for side sleepers? I do notice that when I sleep on my side, wake up with some pain in my hips. Thanks for another great article. I would recommend either a body pillow, like the Snuggle-Pedic, or a knee pillow. Either one of these will help keep your body aligned as you sleep. I hope this helps. Hi Steve, what a fantastic review. I didn’t know there was so much choice in the pillow market. I quite like the Bed Wedge pillow for sleeping a bit propped up if I have a chest cold. I use two pillows when I have a cold, but this looks a much better solution. 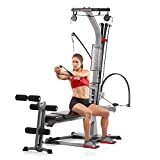 I have a bit of lower back pain from doing heavy squats at the gym, what do you think would be best for that? 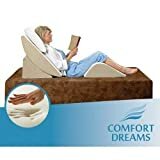 Maybe the Comfort Dreams 3 piece system? Thanks for all that great information. Hi Greg, thanks for stopping by today. The Comfort Dreams 3 piece is a great option, but it does depend on each individual person. The great thing about the 3 piece system is versatility. This pillow gives you the ability to be in a zero gravity position, which works well for a lot of people. Thanks again for your comment, I appreciate it. I liked the sound of this title as I suffer back pain and usually when sleeping. But I find just raising my legs, slightly raises my pelvis and this is where I get the relief from lower back pain. Oh my, you must have suffered from your injury and ongoing too, I feel for you. And it is usually in these times we go searching ourselves to find answers for our own relief and sanity. I don’t know about you, but sometimes I used to think how is this going to get better? I completely understand when you are wondering if things will get better. I hobbled around for 16 months in 2011 with a blown disc. Then 2015 when I injured myself working out, I was bent over at a 30 degree angle for months and many trips to the chiro helped me. A body pillow is a must for me now. Let me know if you have any questions, I am happy to help. Hi Vicki, thanks for stopping by. I completely understand the hips! I have problems with my hips as well and my body pillow really helps keep everything aligned properly. Thanks again for your comment, I appreciate it. I’ve had scoliosis in my mid-back since I was a teenager. 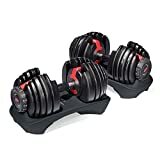 Exercise with weights and weight machines gives me the best relief but also just laying down flat gives good relief so I think the body pillow with bamboo cover looks best for me. I also get hip pain these days when low pressure weather systems move in. One other thing I like to do sometimes is go to the mall and sit in the massage chair. $1 for 5 minutes makes me feel dandy. Thanks Alexander, I appreciate you stopping by. I love the bamboo pillow! I also hear you on the massage chairs, those are great too. Let me know if you have any question, I am happy to help. Ohh Great. Very very informative article and I specially like this article because it not only contains list of diff pillows, but also contains the pros & cons of each. Very helpful. Thank you very much for stopping by, I appreciate it. I tried to build a comprehensive list with a variety of pillows. I am glad you like the article. Please let me know if you have any questions, I am happy to help. Thanks again for stopping by.